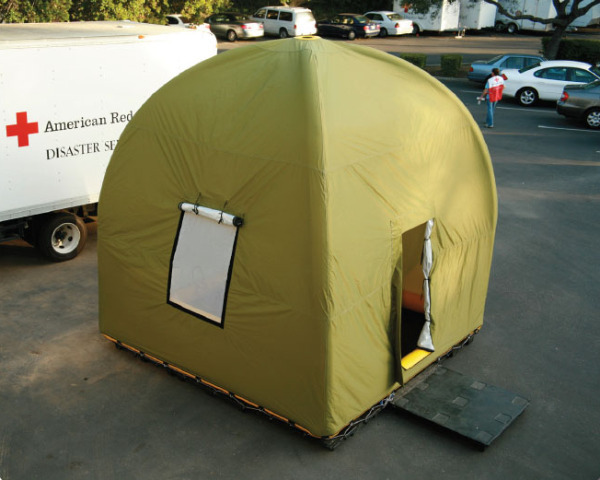 We've seen a ton of emergency shelter concepts, and it's always exciting to see when one of these ideas becomes a reality. Life Cube, an inflatable tent that can set up in just five minutes is an example of a smart shelter design that has actually been built. Packed neatly into a recycled plastic container, it contains all the basic necessities needed post-disaster, including food, water, a battery, lights, radio, solar trickle charger and of course, a place to recuperate. Although the Life Cube hasn't been vetted in a real world scenario, the company has at least had a chance to show it off to the Red Cross. Life Cube offers 144 sq ft of instant emergency space and requires no tools to set up. The shelter arrives in a crate made from post-consumer recycled plastic shipping pallets and can be rolled if necessary using these patented steel round frame inserts. 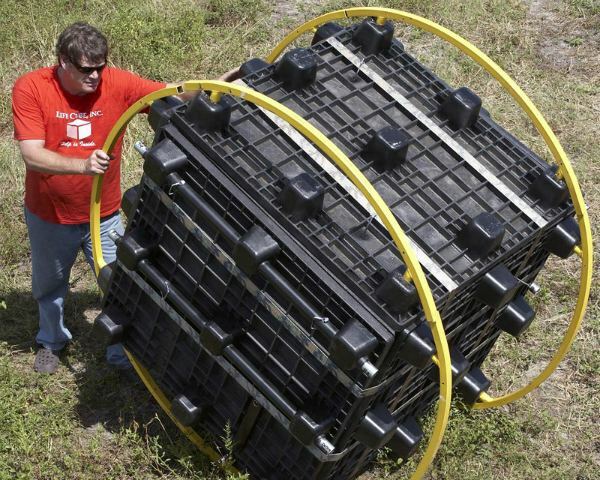 Upon arrival to a safe location, the plastic pallets are removed and laid on the ground in a square with an entrance pad. We have to assume there are 4 panels stowed inside the 6 sided cube in order to make the full square base. Then a CO2 canister included with the package inflates the canopy, which is manufactured by the Patten Company, who has made NAVY life-rafts for over 50 years. The inflatable canopy is made from polyester fabric that is tear-proof and fire-retardant and designed to withstand winds up to 50 mph. There are three doors, which allow multiple shelters to be lined-up and zipped together creating multiple rooms. Along with the shelter and plastic raised platform, Life Cube comes equipped with a table, food, water, communications, first-aid, warmth, bedding, sanitation, and wash station. Optional equipment, like an electrical system with 12-volt battery, solar panel trickle charger, lighting, electric pump, and communications station, propane system with cooking stove and catalytic heater or an infrastructure system with table and telescopic uprights for wind support, could also be included. Life Cube can easily be delivered to a disaster site, and can be used as a mobile command station or even for non-emergency purposes like outdoor events. You can even have your company’s logo printed on it which leads us to wonder if some brands might be interested in sponsoring emergency shelters. Can’t you just see it now, a hundred Life Cubes lined up with the Coca-Cola logo imprinted all over the tents? I hear you about the five minutes, but how long would it take an extremely right-brained blonde? I suspect that the steel wheels attached could be reworked a bit. Even in the photo supplied they were coming apart at the seams. Under more duress they just wouldn't hold up. These wheels working are key to making this a viable option as the whole purpose of this project is to be mobile and convenient. I can't imagine them being of any use in a war/earthquake zone. Thick mud or or water would be the end of them. Something rust proof and long lasting is the ticket. Perhaps some thick rubber or even solid plastic rings that can be reused for some other function within the shelter after being used. 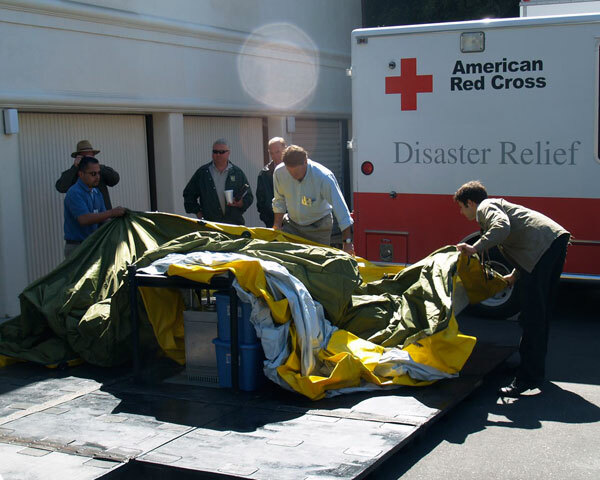 Life Cube had a chance to show off their prototype to the Red Cross to demonstrate the inflatable pop up shelter. The shelter is delivered in a 4 ft cubed post consumer recycled plastic container that folds out to form an elevated foundation. The canopy is then pulled out and affixed to the base platform and using an included CO2 canister, the canopy is inflated. Also included in with the container is a table, food, water, a radio, first-aid, bedding, sanitation, and wash station. Optional equipment can include an electrical system with 12-volt battery, solar panel trickle charger, lighting, electric pump, and communications station; propane system with cooking stove and catalytic heater; and infrastructure system with table and telescopic uprights for wind support. The whole unit can be set up in less than five minutes and requires no tools. The Patten Company, who has made NAVY life-rafts for over 50 years, manufactured the canopy out of Siemens polyester fabric that is tear-proof and fire-retardant that can withstand winds up to 50 mph. Once set up the shelter provides 144 sq ft of protected space that can withstand almost any weather condition. The shelter comes equipped with three doors so multiple shelters can be lined up and zipped together to create multiple room units. The container can easily be moved via steel circular frames that insert to make a large wheel to roll the container. Life Cube also makes a Mobile Command Unit, which includes a few more amenities necessary for disaster management. The Mobile Command Center is a versatile unit combining the convenience and efficiency of a base of operations complete with specific end-user needs. The units can also be used for commercial purposes and logos can be imprinted onto the canopy.